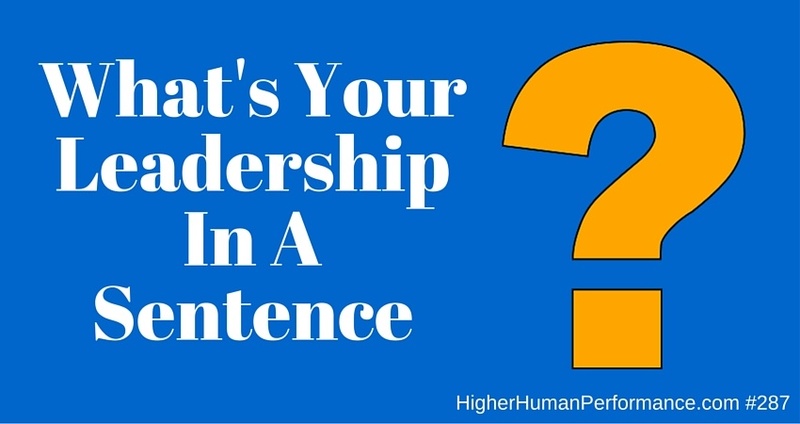 287 What’s Your Leadership In A Sentence? During a sales training session one day back in the 1980’s I uttered a sentence that I hadn’t prepared. It just popped into my mind after a sales person wanted to know what he could do to better qualify prospects. The conversation turned to the challenges of not only qualifying, but delivering happiness. That’s when I finally said something I had long believed and practiced, but I hadn’t yet crystalized it into a single sentence. The quality of your questions determines the quality of your business. I went on to explain why. When we’re trying to best serve a prospect, questions help the prospect distill what he really wants or needs. When he shares that with us, we’re better armed to provide the best solutions. When we’re trying to deliver happiness to a customer, questions help us avoid pitfalls and unknowns that would foil our efforts. Maybe most important, when we’re asking great questions of our prospects we’re learning more about them and that shows we care enough to get it right. We’re earning their trust. The shocking thing is, we’re also benefiting from being unique because our competitors aren’t likely asking these questions. They’re just trudging forward into full-blown sales mode. By asking great questions we’re morphing away from salesmanship toward high value service. A few years ago during a session where I was working with some young men about public speaking I issued this challenge. When you’re done, the audience should be able to tell somebody what you said in one clear sentence. If people can’t restate what you said in a single sentence, then you neglected to be clear enough. My advice was simple. When you’re constructing your speech or presentation, have one clear sentence that sums up your speech. Then stick to it. When you’re finished crafting your speech, review it and see if you can still use that one clear sentence you used at the beginning. 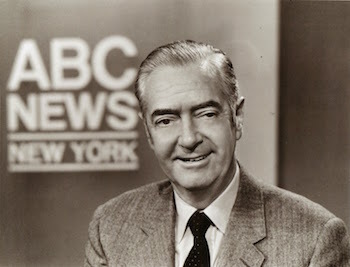 When I was in journalism school Howard K. Smith was a national broadcaster with ABC News. I was at LSU, but it had nothing to do with the fact that Mr. Smith was from Ferriday, Louisiana. At the time, I’m not sure I knew that. What I did know is that he was a talented broadcaster with a keen grasp of language, especially the English language. He and Edwin Newman were among my favorite news broadcasters (although I admit there were many good ones back then). One day I came across an article or something that said Howard K. Smith required his young children to sit down every day and write one clear sentence. He wanted his kids to learn to distill a thought into one clear sentence. I thought it was brilliant. Simple, but brilliant. I was still a teenager when I read it. That illustrates how spectacular it was because if a 17-year-old version of me could be dazzled by Mr. Smith’s homework assignment for his kids, then it was noteworthy. Now, over 40 years later it seems even more brilliant. I think more parents should do it. These are powerful concepts, but even more powerful practices. In a world where people can be determined to sound smart by making things overly complex, the most powerful ideas are the ones most simply stated. Many of us want to do a lot of different things. We chase all the squirrels of achievement that strike our fancy. And it’s this same principle at work – our inability to see the power in simplicity. So let’s aim our attention toward our leadership. If you’re the top leader – the CEO – of an organization, all eyes and ears are on you. When that’s an idea you want to embrace you love it. When it’s not, you tend to forget it’s how life is really happening. One morning you enter the office preoccupied by something that has nothing to do with work, but the entire office notices it. You don’t. You just think it’s all happening in your head, completely unaware that it’s impacted your demeanor, your tone of voice, your body language and your facial expressions. In your head, this morning is just like most other mornings. Nothing noticeably different for the troops. This goes on all morning long and by noon the place is overrun with rumors that something is afoot. And it’s not good. Speculation is running rampant because today you didn’t show up like you should have. It happens. Well, the rumors don’t always happen, but we often show up differently than we think we do. Quite often because we neglect to pay close enough attention to how we’re impacting others. It’s especially true when we’re the leader. All you have to do is think about the word. Leader. Leaders lead. Others follow. That means leaders have to show up to lead. That’s important because in my working with CEO’s and top leaders I’ve often found that some days the leader wants people to focus on him or her, then other days, they can become frustrated, even angry, that people are “too focused” on them. If you’re the CEO you have to show up for your people every single day. And that’s a daunting task, with awesome responsibility. It’s not for everybody, but for those who take it on – it’s a vital role every organization needs. A great leader serves the organization – and the people in it – in ways nobody else can. So think about a single sentence that might properly depict your leadership. Your single sentence statement about your leadership is your simple, concise statement about your leadership. I don’t expect you to get it right the first time. In fact, I’d urge you to consider keeping a diary of your one-sentence daily. It might be a very profitable thing to even consider writing down your single sentence before you enter the office of what you’d like it to be that day, then write another sentence at the end of the day to see how far apart the two might be. Many executives have found that little – and crazy simple – exercise worthwhile because it reveals the gap between who we really are and who we really want to be. No, I’m not going to give you any examples because I want you to think for yourself. This isn’t about something else. It’s not about your most ideal version of you either. It’s about what you think and how you feel about your own leadership. It’s about getting on paper (or into Evernote) a single sentence statement about your leadership. People often think that any kind of assessment, taken at one moment in time, may properly depict them, but consider this. It’s a moment in time. I’m not talking about these scientific assessments where the questions remain the same and we may be tainted because we already know (and have answered) the questions. I’m not smart enough to know how you might take such an assessment and get a completely different, but inaccurate result because you’ve seen the questions before. But I know that the answer to single question can change over time. They have for me. Time, experience and perspective impact not only our perceptions, but our reality. That’s why I’m very fond of the daily “before” and “after” kind of exercise. One single sentence before walking into the office and one single sentence at the end of the day after leaving the office. Do that long enough and you’ll likely discover a few important things to help you become an even better leader. If nothing else, the exercise will force a bit of introspection and that’s something every leader could use. I’d love to hear from you if you decide to tackle this challenge. Let me know what your before and after sentences are. Tell me how this has impacted you – if it has.